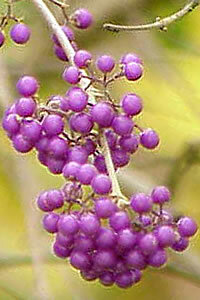 Bright purple berries ripen in autumn and persist until well into the winter and occasionally even into the spring. This bushy deciduous shrub grows to 10 feet high with an 8 foot spread. Fruits most prolifically during long hot summers and when planted in groups. For maximum freshness, please keep seed refrigerated in its original packaging until it is time to plant. Sow seeds in containers in a coldframe, or other sheltered location, in the autumn or spring. Grow in fertile, well-drained soil in sun or dappled shade.